Loosely based on the Iliad and the Aeneid, these 12 painted scenes from the 16th century tell the story of the Trojan War and the life of the Trojan hero Aeneas . 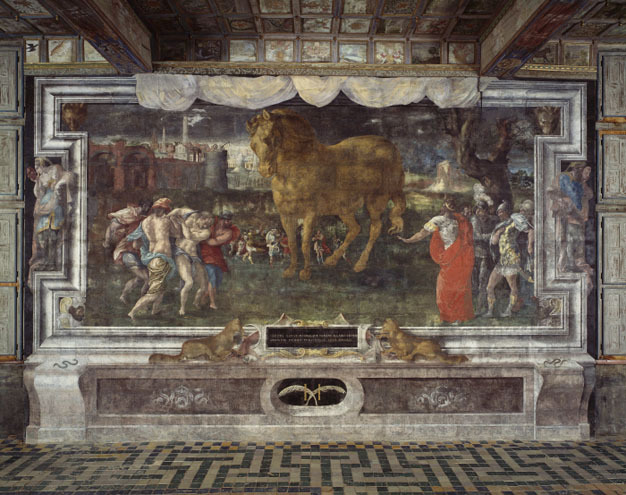 The paintings in the Gallery are among the finest examples of mid-16th-century art. 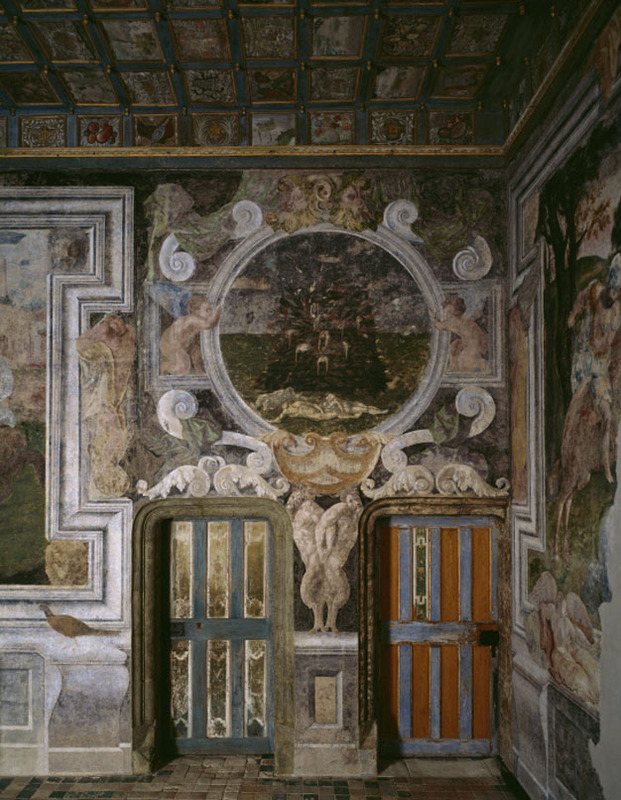 They were created by an unknown artist from Francesco Primaticcio’s entourage, probably French, with an intimate knowledge of the decorative styles of Rome. The artist painted vast scenes illustrating the story of Troy and three episodes from the Aeneid by Virgil (70-19 B.C.). The paintings are housed in trompe l'oeil frames, featuring figures that relate to the subject. The floor is covered with grey, green, blue and yellow enamelled tiles. The surface area is divided into square compartments, representing five separate works. The central compartment houses a labyrinth. 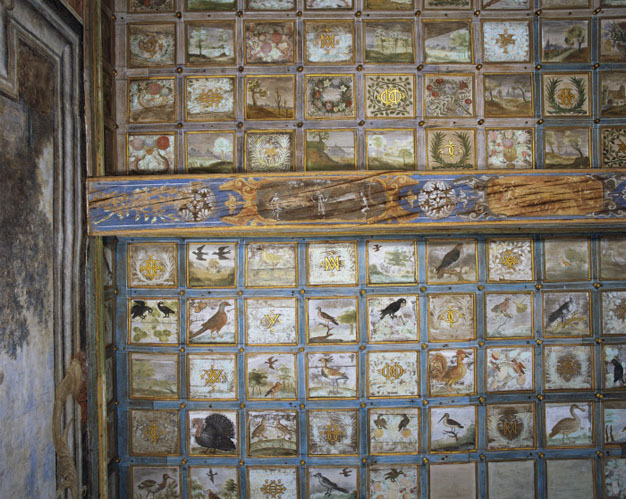 The ceiling is fixed to a floor, supported by 10 beams, and divided into small, painted, square chambers, most of which date from the 17th century. However, the ceiling was damaged by fire in 1627. The man who commissioned the décors in the gallery, Claude Gouffier, Grand Equerry to the King, reflected his loyalty and devotion to the monarch here. The fireplace, for example, includes an iconic figure with weapons, coat of arms and his chosen motto “hic terminus haeret” (here is the end of all things). The inscription, only part of which remains, indicates that the gallery is dedicated to Francis I of France: “Roi des français, prince très chrétien, très invincible et très puissant” (King of France, devout Christian prince, invincible and all-powerful [...].) 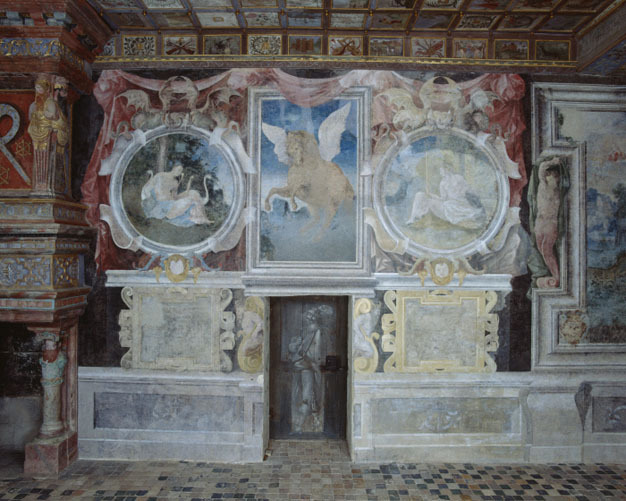 The painted figures in the frames are as follows: in the centre, Pegasus (a personification of the king’s reputation); on the left, Apollo; and on the right, Mars or Minerva, the gods of art and war. The gods are assembled for the wedding of Peleus and Thetis (Achilles’ parents). Eris, the goddess of discord, depicted with bat wings, disrupts the festivities by throwing the golden apple of discord among the assembled attendees, intended for the fairest goddess. Jupiter refuses to choose, instead ordering Mercury, standing before him, to take Juno, Minerva and Venus to Mount Ida, where Paris will decide who is the fairest. 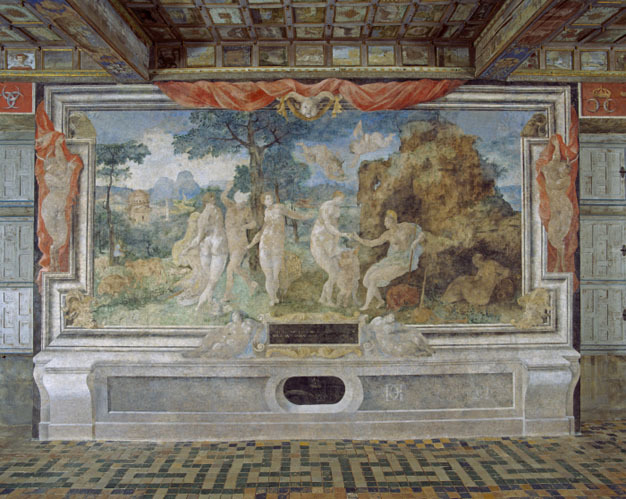 At the bottom, in the centre, is a vast, naked old man lying in an oval alcove. This man is Demogorgon, the father of the gods, whose eldest child is Discord. Seated near a cave, Paris hands the golden apple to Venus, crowned with two cherubs, who have promised him the love of the most beautiful woman in the world. Mercury is surrounded by Juno, accompanied by her peacock which threatens Paris, and Minerva, who is collecting her clothing. In the background, on the left, is an attractive landscape featuring ancient buildings, while a seated herdsman plays the bagpipes while watching over a herd of cows. The motif at the top of the composition has a precise meaning: the human mask with donkey’s ears and cow’s horns appears to be an allegory for the herdsman, whose stupidity would lead to the downfall of Troy. The Abduction of Helen by Paris and the battle scene take place in a vast landscape showing the city of Sparta in ruins (the city of which Helen was queen) and its port, with the Trojan ships in the water. The dramatic atmosphere of the stormy light conditions and framing figures presage the fatal consequences of this abduction. In the frames, the Furies call for vengeance against Paris, with the heads of the lion and wolf personifying anger and violence. 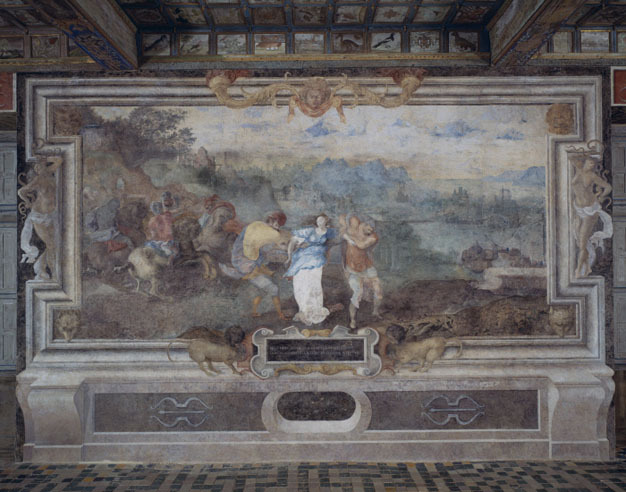 This scene depicts the moment when the goddess Diana switches a deer with Iphigenia as her father, Agamemnon, prepares to make a sacrifice to call the storm that would hold the fleet at Aulis, preventing the Greeks from departing for battle. The inscription denounces the attitude of Agamemnon and the Greeks, who had ruined the city: “Vous avez apaisé les vents par le sang et le meurtre d’une vierge” (you have calmed the wind through the blood and murder of a virgin). The figures in the frame complete the scene: the unicorns evoke the purity of the sacrificed young girl, the dolphins echo the racing boats, the chubby faces reflect the wind, and the cow heads allude to the sacrifices. The story of the Trojan War commences with the battle scene. Behind the combatants stands a coastal city and a two-storey colonnade that represents a real ancient building: the Piliers de Tutelle in Bordeaux. 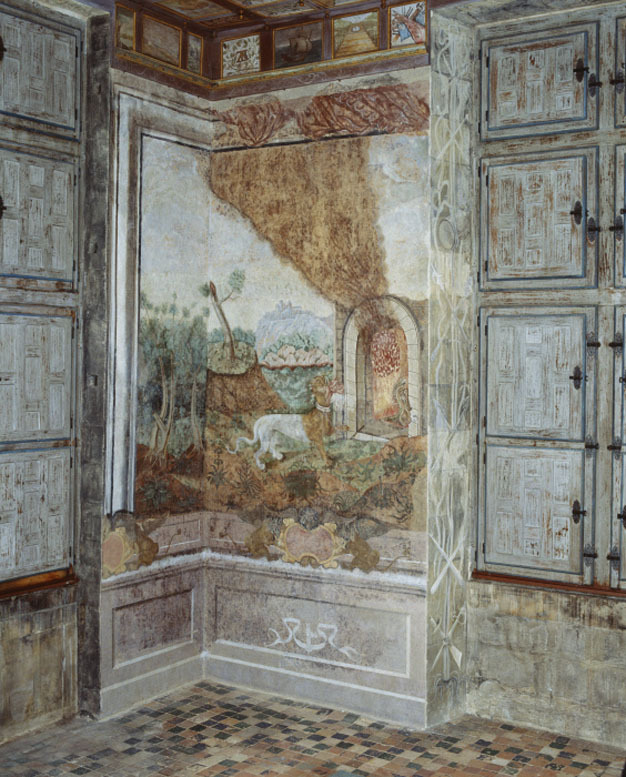 This piece, the smallest of the paintings, occupies the wall above the two doors leading to the chapel and the staircase. The episode does not reflect the chronology of the story, since Patroclus’ funeral did not take place until Achilles, his friend, had avenged his death by killing Hector, his murderer (Scene IX). The figures in the frame (satyrs, cherubs, and long-haired and bearded masks) are purely decorative in nature. 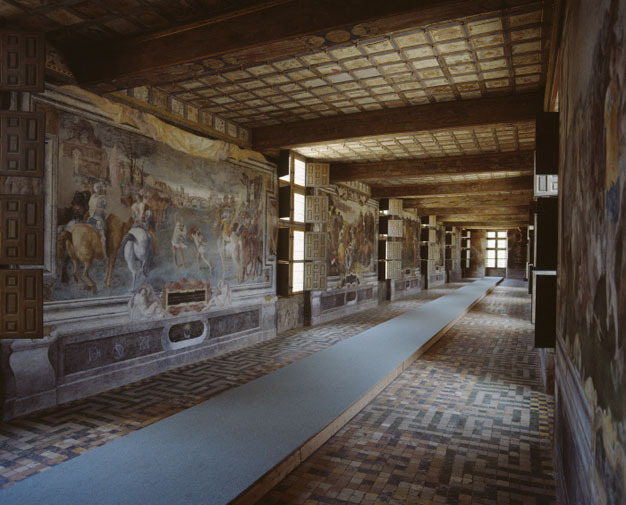 This, the largest composition in the collection, occupies the entire rear and western wall, up to the first window. It is not possible to identify the exact scene shown here. In all probability, it is a depiction of a typical battle, with the combatants wearing ancient-style dress but with weaponry on the ground from the Renaissance era. The inscription indicates that this piece depicts the duel between Paris and Menelaus, King of Sparta and Helen’s husband: “Ni le combat singulier, ni les sacrifices, ni les autels de Priam ne peuvent effacer la souillure du lit nuptial” (Not the duel, nor the sacrifices, nor the altars of Priam can wipe away the stain of this marriage). The associated figures provide a commentary on the scene. The hares depict the cowardice of Paris, who attempted to flee from Menelaus, here depicted by lions’ heads. The urban landscape is identified as a view of Rome: Tiber Island, Pons Fabricius, the Capitoline Hill and the Palatine Hill. 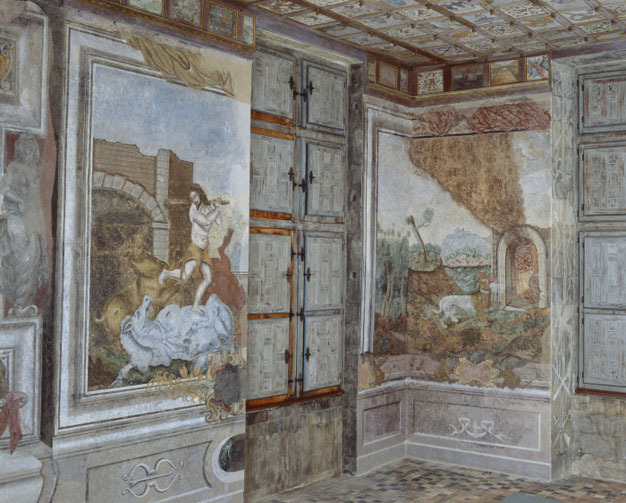 The accuracy of this representation shows that the artist had seen the city of Rome in person. The inscription clearly identifies the battle: “S’ensuit le terrible et lamentable massacre qu’après la mort d’Hector Achille infligea aux malheureux phrygiens” (Then came the terrible and lamentable massacre that Achilles inflicted on the unfortunate Phrygians following the death of Hector). 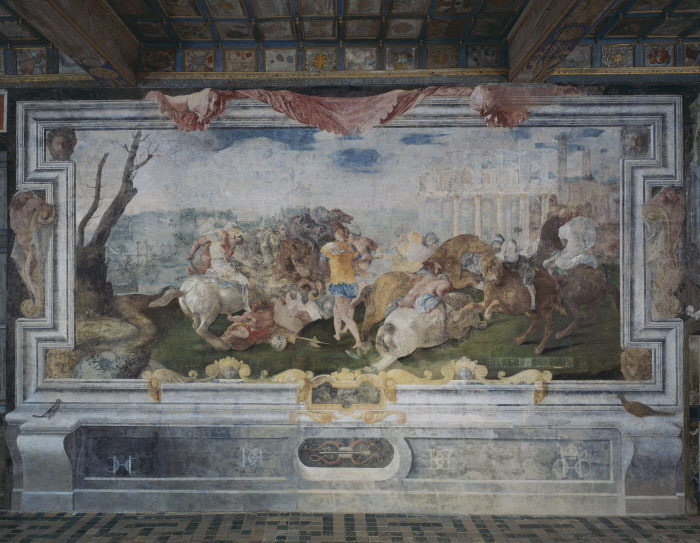 The scene depicts the death of Hector during an ambush by Achilles. 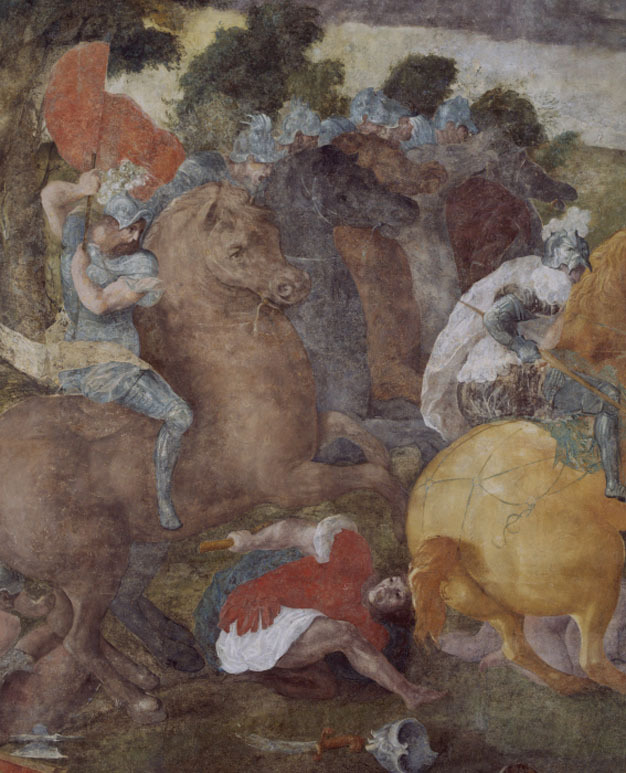 This version of events is taken not from Homer, but from Dictys Cretensis, probably because this story allowed the artist to paint a battle scene with horses. The city, perched on a rocky outcrop, alludes to the ancient world. In the frames, the heads express horror, the winged mask shouts with fright, the putti hold their heads and cry, the two scrawny women personify misfortune and ruin, and the black cows’ heads symbolise death. Only the two female figures resting on long sticks bring a note of hope: they are depictions of Constance, heralding the future intervention of Aeneas. This wooden horse, filled with Greek fighters, was brought into Troy through trickery by Sinon, a Greek soldier and traitor. It stands at the centre of the scene. Behind is Laocoön (priest of Apollo) ready to throw his spear into the horse’s stomach to prove that it was hollow. In the foreground, Sinon is brought before King Priam, dressed in red and wearing a crown. The figures in the frame depict evil, violence and trickery. The horse strategy works and Troy is captured. The horse is depicted abandoned on a square. Trojans flee in the foreground: Aeneas carried his father, Anchises, on his back and pulls his son, Ascanius, by the hand. They are heading towards a daytime scene depicting ships ready for boarding. The inscription features two verses from Virgil’s Aeneid, spoken by Aeneas, who now becomes the main character of the cycle: “Quelles paroles pourraient dépeindre cette nuit de massacres et ces funérailles ? Quelles larmes répondraient à nos malheurs ?” (Who has words to capture that night's disaster, tell that slaughter? What tears could match our torments now?). The female figures at the sides cry in despair, their ankles tied and their hands bound, alluding to the fate that awaits the defeated, destined for a life of slavery. In the centre of the scene, on a rocky platform, the Cyclops and Vulcan forge Aeneas’ weapons. 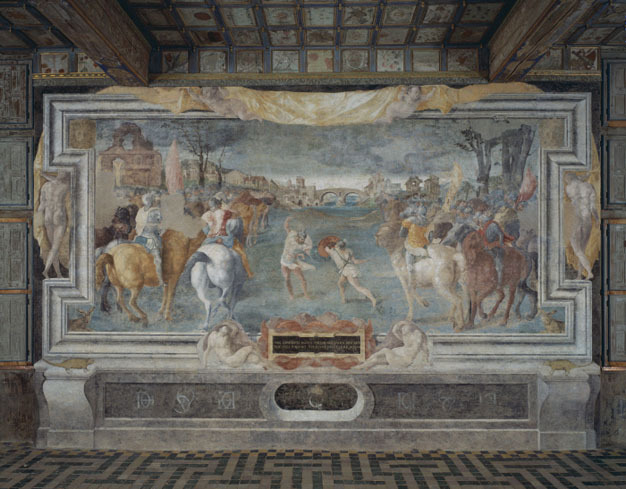 This painting is a brief summary of the hero’s adventures, with the scenes to the sides alluding to the Trojan warrior’s journeys on the seas and the conquest of Italy, recalling the divine protection that he enjoyed. 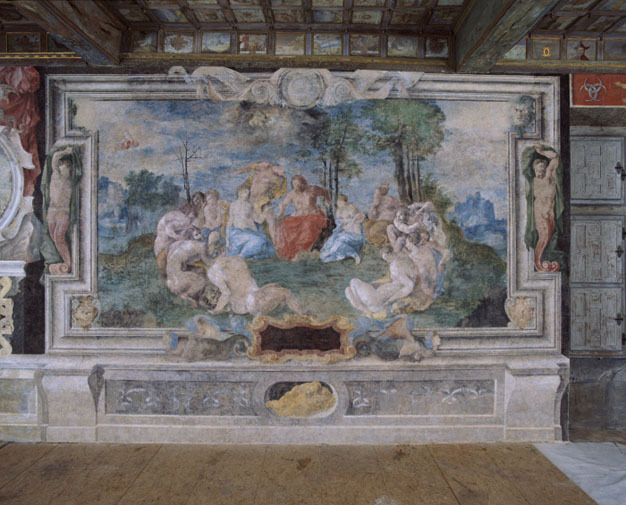 This painting was entirely recreated by Louis Gouffier, following the addition of the window, and perhaps after the fire in 1627. It represents Hercules and the mares of Diomedes. 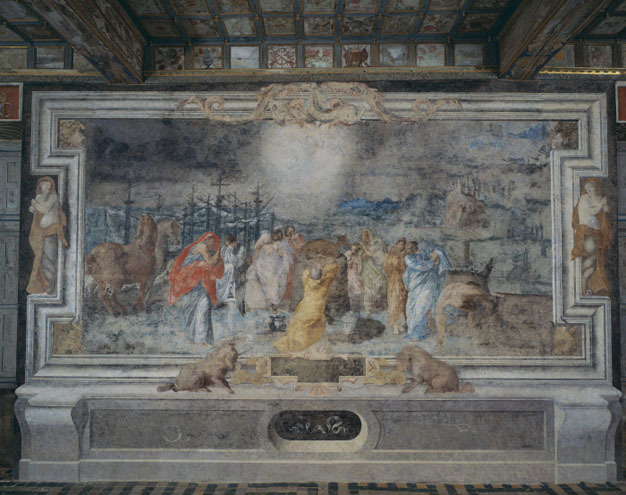 However, the golden bough that appears on the bottom frame is a remnant of the original composition and provides evidence of the initial, but now long-gone subject: Aeneas’ visit to the Sibyl. 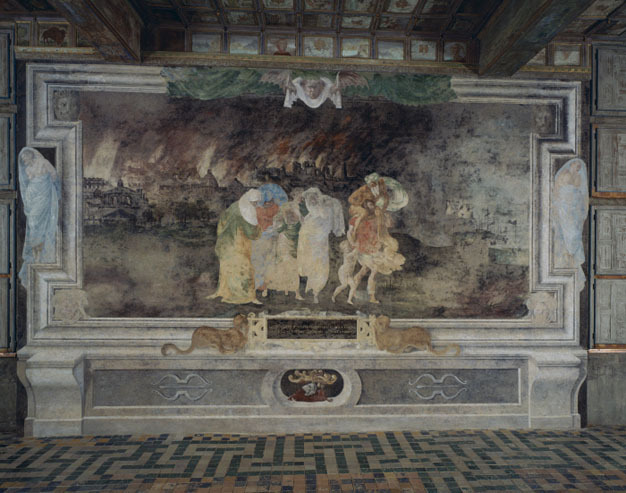 The final composition, the first to be painted, stands at the very end of the south-western wall, up to the fireplace. On the left is the entrance to the underworld, guarded by the dog, Cerberus. 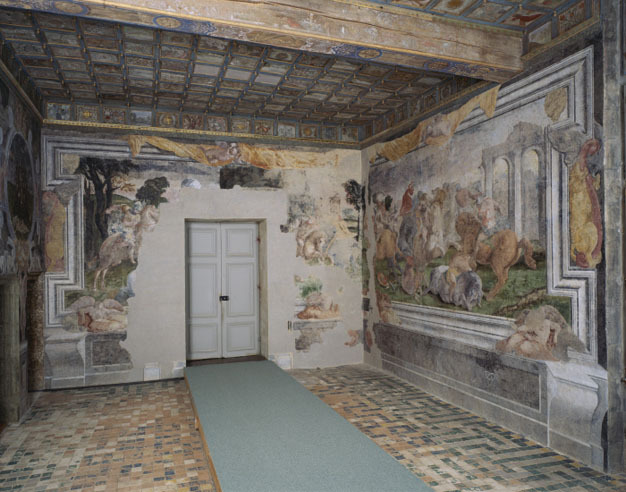 The entire section was repainted under Louis Gouffier, based on the original remains. The right-hand section is authentic. It depicts Tartarus (where Aeneas did not go, but which was described to him by the Sybil), where criminals receive their punishment. 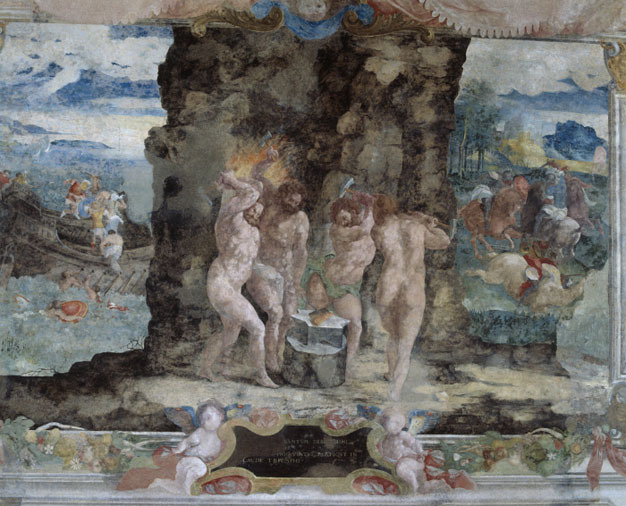 The Underworld scene at Oiron does not match Virgil’s description, instead reflecting a modern illustration of the French translation of Hypnerotomachia Poliphili (The Dream of Poliphilus, 1546).